Time Portal & Seanchai Library present VICTORIAN TALES, Live! 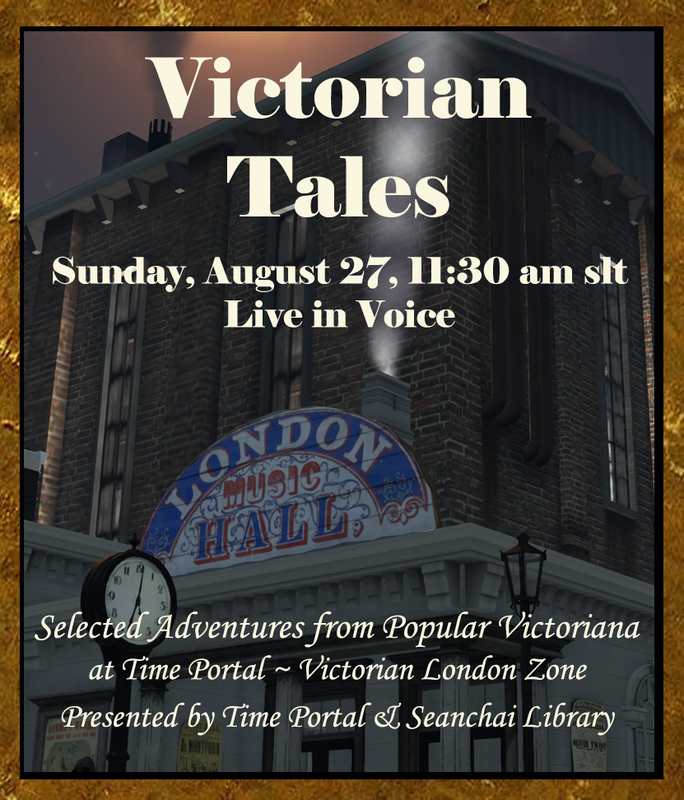 Seanchai Library brings classic Victorian literature to the Time Portal's Victorian London Zone on Sunday, August 27th at 11:30 am slt, live in voice, in a 90 minute session open to all interested residents. The Time Portal is a single region with a broad selection of time zones: from Tudor England, to 18th Century France, to the 1950-60s. The entire region is divided into zones that gives a taste of history. It connects to creators and performers that also celebrate the historical recreation of those eras. Frau Jo Yardley is well known for her creation and nurture of the detailed, historical, and highly popular 1920s Berlin in Second Life. Last year she, and a group of like-minded historical enthusiasts, extended this concept to create the Time Portal project. To quote the Time Portal blog site, its goal is to: " . . . not only offer you the chance to shop with some of the best vintage, retro and historical creators in Second Life but where you can also rent an apartment, visit a club, see a show at the theatre, watch a movie at the cinema or learn something new at constantly changing exhibits in the museum.
" a community for Time Travellers and history lovers. You may be a Victorian Urchin living in a dirty old attic, your neighbour could be a 14th century princess living in a tower, while the guy living across the street enjoys walking around in his Roman armour. Time Portal will not be a role-play sim (although it will of course be allowed), there won’t be a dress code, anyone will be welcome." Working with Seanchai Library, the Time Portal is extending that idea to live literature and spoken word. 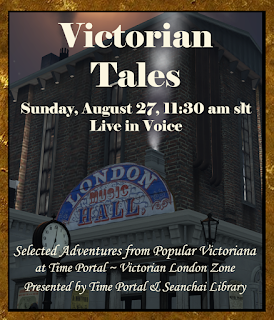 Seanchai Library is hosting 90 minutes of stories from Victorian Literature at the Music Hall, live in voice. Victorian Tales will be presented by a gifted line-up of voices: Corwyn Allen, Fayleen Bellois, Cybele Moon, Dubhna Rhiadra, and VT Torvalar with scintillating adventures from penny dreadfuls to classic Victoriana, hosted by Caledonia Skytower. Selections from Edgar Allan Poe, Kipling, and other icons of Victorian Literature are sure to be part of the program. Arrive early to allow the highly detailed region to rez, and to explore the features of the Victorian Zone.